Hanging the clock with a stud. – Now you may hang the clock on the wall. A secure screw coming directly out of the wall works well for this clock. If a stud behind drywall is available, always use the stud with a screw coming straight out of the stud through the drywall exposing about 1/2 – 3/4 (far enough so the head is on the inside of the clock) of an inch outside the drywall. We recommend using a screw instead of any type of hanger. Hanging the clock without a stud. A zip wall anchor is the easiest, yet the strongest way to go if you have to use your sheetrock and cannot find a stud (studs are best to use). Zip Anchors are the fast way to provide light duty anchors in gypsum wall board (dry wall). Their course and wide thread design and self-drilling point offer you a very quick and easy installation. Zip anchors are made in both steel and engineered nylon. Use these with #6 and #8 sheet metal or drywall screws. I usually use the nylon type. These are sold by weight capacity and we recommend a zip anchor with a test of about twice the weight of the clock. To install plastic wall anchors, tap a small hole smaller than the anchor itself (plastic piece). With a Phillips head screw driver, screw the anchor into the wall until the head is flush with the wall. Do not over tighten as this will reduce the gripping power of the anchor. Use a screwdriver to screw a metal screw into the plastic anchor until the screw is completely inserted into the anchor and leave about of the screw 3/4″ exposed where you will hang your clock. (appropriate screws are usually included with wall anchors when purchased). 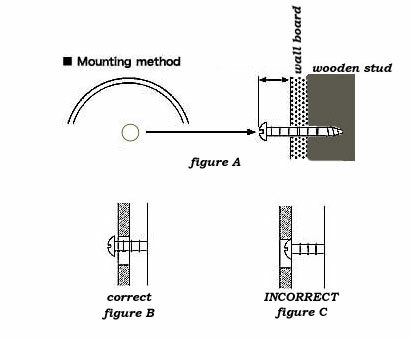 **The screw or hanger must extend through the mounting hole in the clock as in the image figure B.